"American Chestnuts Today" by Dr. Carmen Medina Mora, Tuesday, February 5, 6:30 - 8:00 pm, Grand Traverse Conservation District, 1450 Cass Road, Traverse City. Join Dr. Medina Mora, from Michigan State University’s Department of Plant, Soil and Microbial Sciences, as we discuss the return of the American Chestnut. 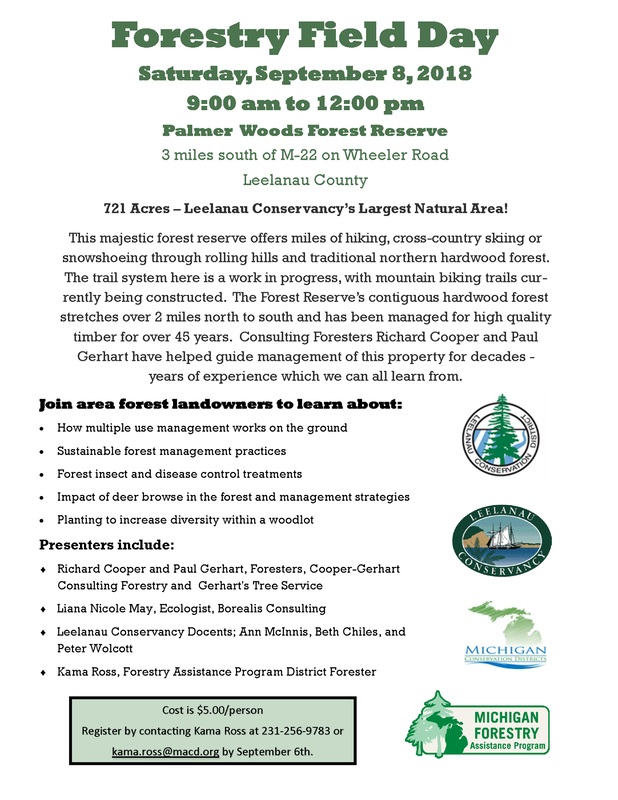 Contact the Leelanau Conservation District at 231-256-9783 for more information. Leelanau CD—Wed. March 20, 6:30-8:30 pm, 8527 E. Government Center Drive, Suttons Bay. Emphasis on invasive species removal techniques with and without the use of chemicals by Liana May, Borealis Consulting and Katie Grzesiak NW Michigan Invasive Species Network Coordinator. LCD staff with recommendations on the native plants to replace them with. Benzie CD—Thurs. March 21, 6:30-8:30 pm, Homestead Township Hall, Honor, "Remove Invasives; Plant Natives!" Hands-on Pruning Demonstration with Fritz Girrbach of Brothers Tree Service, Saturday, March 23, 10:00 am to noon, GTCD, 1450 Cass Road, Traverse City. Before the trees leave dormancy, learn how to do corrective pruning on all types of trees and shrubs. $5/person. Contact the Leelanau Conservation District at 231-256-9783. "Forest Mushrooms," presentation by Linda Schribner, Wednesday, April 3, 6:30-8:30 pm, Mills Community Room, Benzonia. 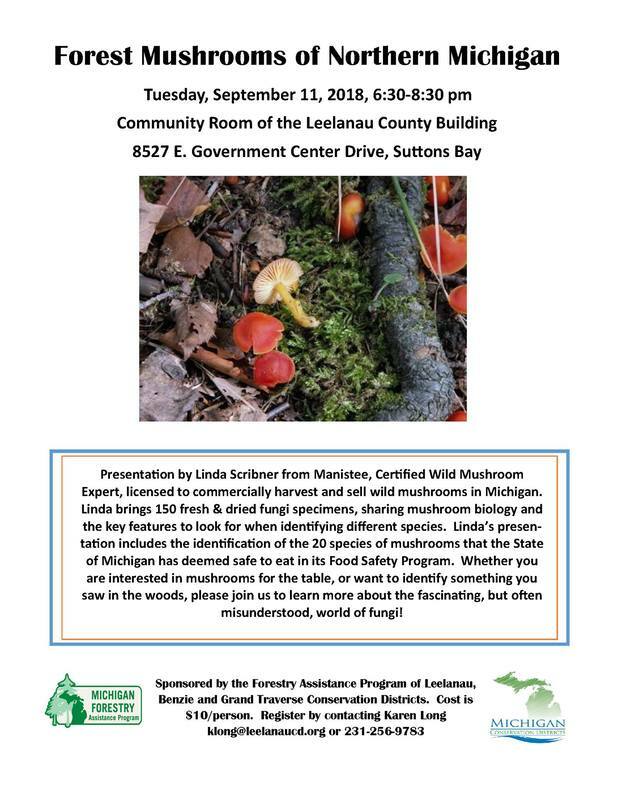 Linda is a certified forager who can commercially harvest and sell wild mushrooms in Michigan, $10/person. Contact the Benzie Conservation District at 231-882-4391; aime@benziecd.org. 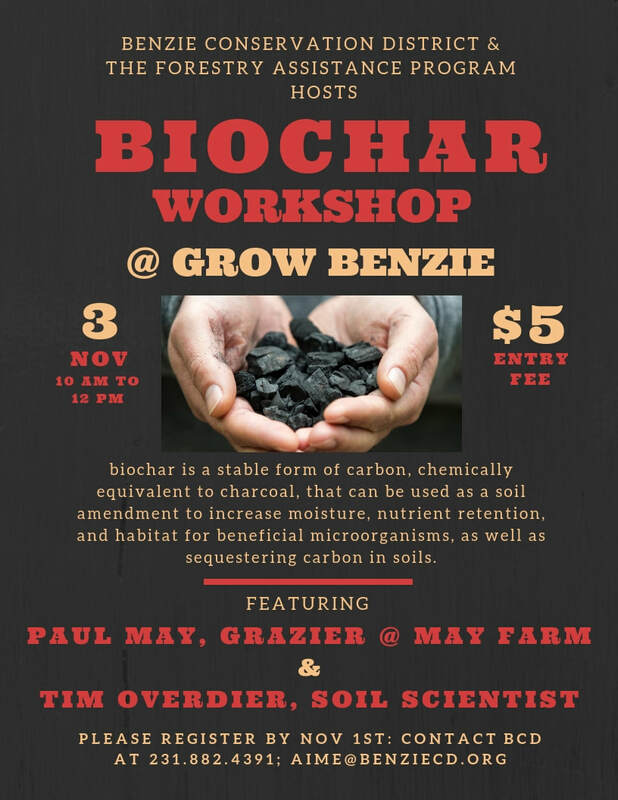 DOWNLOAD BIOCHAR PRESS RELEASE BY CLICKING HERE! 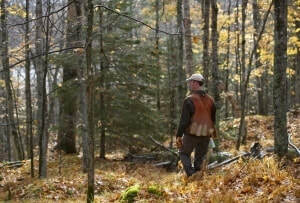 Michigan’s 4 million acres of state forest land require a lot of careful planning to keep them healthy and thriving. That’s why the DNR finalizes plans for each forest management unit two years in advance of when any management activities – prescribed burns, timber harvests or tree thinning, for example – actually will take place. For more information – including a link to the interactive forest map showing details of forest management activities, and the forest open house and compartment review schedules – visit the public input section of the DNR’s michigan.gov/forestry webpage. 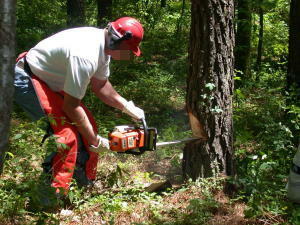 SAWW Training is an umbrella organization that promotes safe and efficient chainsaw use, for both professionals and backyard chainsaw operators. The four full-day course begins January 24, 2018, and is designed for both professionals and backyard chainsaw operators. The program is limited to 10 participants and we would like to offer the opportunity to tree professionals, as well as to area landowners. Click on link to download flyer. Forestry Field Day at Interlochen Center for the Arts! Got spring fever? Click here for info on our Planting Workshop!